The O.N. Jonas Foundation, in cooperation with the Creative Arts Guild, continues the school year with their Artists in Residence programs. Laughing Matters. Tommy Futch is the President of Laughing Matters, an interactive entertainment company. In addition to improvisational comedy, Laughing Matters’ repertoire includes team-building, murder mysteries, game shows, scavenger hunts, and school performances. Its programs are used in national team-building exercises, product launches, and award presentations. The company also offers an improv comedy college and a training program to enhance attorneys’ courtroom performance. Ron Anglin became a juggler at age 8. After graduating high and West Point, he entered the Army, where he gained the confidence to start performing in public. In 1990 he began teaching high school. He coached Wrestling, Soccer, and Swimming and got his Master’s Degree in Education from Columbus State. He was given a Teacher of Excellence Award and also selected as a STAR Teacher. He would use his juggling as a way to gain his students’ attention, and later realized he could use it to teach all kinds of lessons. In 1999, he left the Classroom to become a Comic & Educational Juggler. He called his act Quite a Catch and began performing in schools, libraries, and festivals. 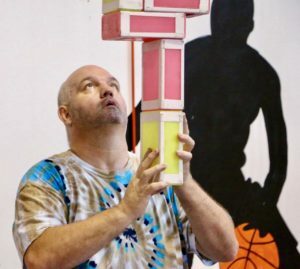 In 2001 he was selected by Cirque du Soleil to lead their Cirque du Monde program in Atlanta, which targeted “at risk” teens and used Circus Arts as a way of teaching positive life skills. Moscow Nights, an ensemble of talented Russian folk musicians, tours with Golden Gates, featuring dances from Russia, Ukraine, and Georgia. They are embarking upon their 20th season across the United States and performing in venues as diverse as evening concerts, arts councils, festivals, and school shows. A typical school performance includes songs, rituals, folk stories, audience participation, and dances that have been carefully researched and recreated in performance. 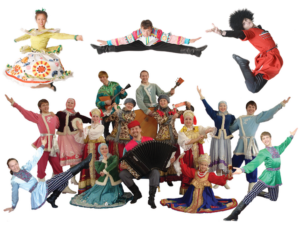 The dancers will thrill your audiences with their skillful virtuosity, colorful costumes, the syncopation of footwork, and gymnastic leaping of foot-stomping ferocity. 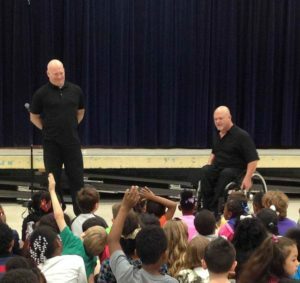 The programs are available to schools in the Dalton Public Schools, Murray County Schools, and Whitfield County Schools. Programs cover areas of the fine arts, including visual arts, music, theatre, and dance. Program sponsors are committed to sustaining and growing the program as well as educating the public about the value of an arts-rich curriculum for the schools. For a full listing of Artists in Residence scheduled for the 2018-19 school year, visit www.onjonas.org. The public is welcome to attend any performances. Please check with each individual school to confirm the schedule.